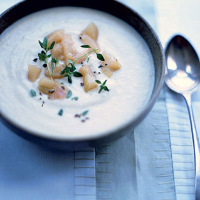 This recipe, from Skye Gyngell of Surrey's Petersham Nursery, uses the principles of vegetable soup to create a stunning dish. This appears in Soup Kitchen (Collins; £17.99). Trim the cauliflower and cut into florets. Melt the butter over a gentle heat in a large pan. Add the shallots and sweat for 10 minutes. Add the cauliflower, garlic and thyme. Cook, stirring now and then, for 2 minutes. Season. Add the stock, cover, and simmer for 10-15 minutes till the cauliflower is soft. Fish out the thyme. Meanwhile, make the relish. Melt the butter in a pan over a medium heat. Add the pear and apple and cook for 2-3 minutes till they soften. Add the other ingredients and cook, uncovered, stirring often, for 25-30 minutes or until thick. Remove the thyme. Season. Add the cheese to the cauliflower, add the cream then liquidise. Return to the pan and check seasoning. Ladle into bowls, put 1 tsp relish on each, and serve, garnished with thyme.